The design and construction of surface water intakes is connected with the need to take into account the protection of ichthyofauna. Surface water collection may result in a loss of existing or migratory fish populations in the vicinity of the water intake. This is particularly true of juvenile fish and individuals who are currently in a worse state, that is, fish of very small size and poor swimming capacity. Fish may be mutilated by their attraction to the grid at the intake, which they cannot break away from due to too high a water intake speed, or if they are pulled into water intake devices, from which they cannot escape. For this reason, the use of grilles on inlets for water intakes is not a sufficient solution and additional safeguards are necessary. Such an additional safeguard is the NEPTUN system, which protects water intake from the entry of fish into the area affected by the intake. 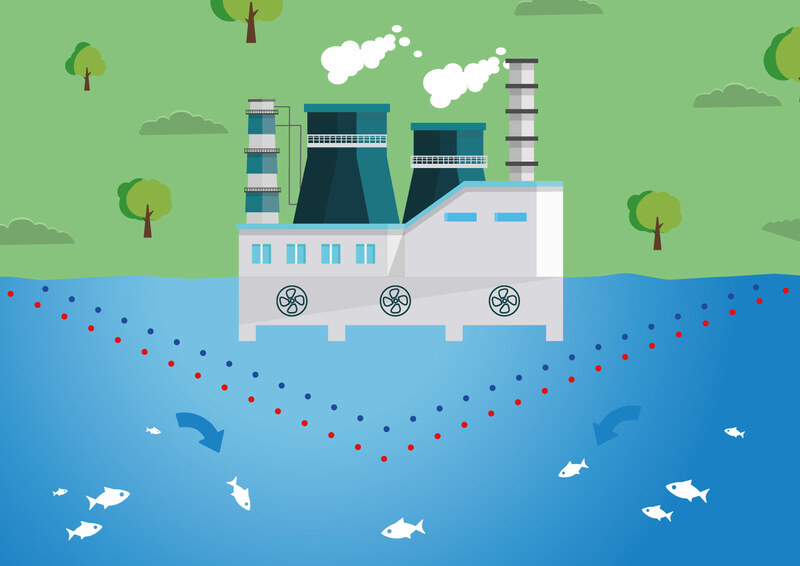 Positive and negative electrodes, fixed to the bottom in a fluctuating manner and between which an appropriate electric field is generated, are installed at such distances from the water intake that the fish have the time and power to react to the field acting on them. Thanks to such an approach and appropriate installation design, the NEPTUN system achieves a very high efficiency.